Every year, the Friends of Coronado Historic Site sponsor a Dia de los Muertos exhibit. This year we decided to honor Janice Daigh, a devoted friend and volunteer of Coronado Historic Site. 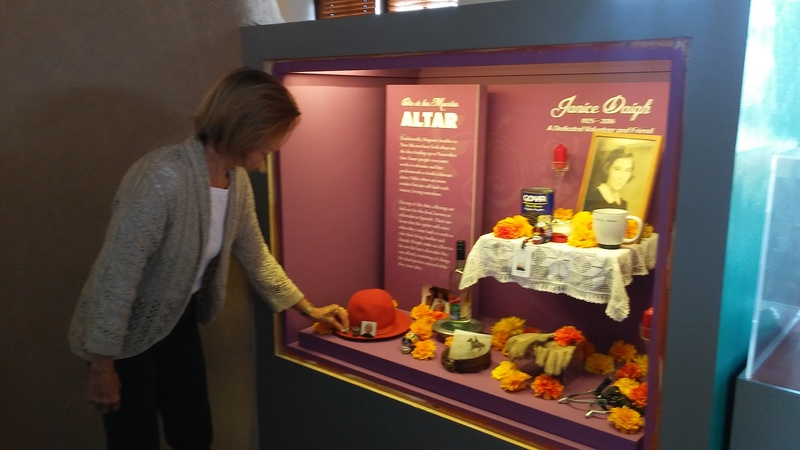 We are featuring this altar display in the core exhibit in the Hispanic traditions/religion section. Janice’s daughter Ellen joined Ranger Ethan on the installation day to add personal items that belonged to her mother. Visit Coronado Historic Site to learn about the history of Dia de los Muertos, and to help us remember the spirit of our friend and volunteer. Tags: Altar, Aztec, Coronado Historic Site, Culture, Day of the Dead, Dia de los Muertos, Dia de los Muertos Altar, Exhibit, Hispanic, New Mexico, Southwest, Spanish, Temporary Exhibit, Volunteer. Bookmark the permalink. Previous post ← Looking for a Few Good Docents!